Murtaza and Lotfullah remove a spark plug. 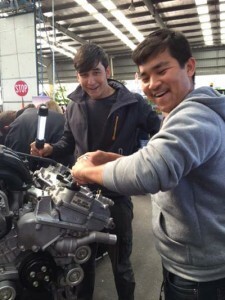 About 50 students from AMES Youth 3 classes attended the Try a Trade event at Cranbourne Racecourse recently. Facilitated by the South East Local Learning and Employment Network and held as part of the South East Careers Expo, the event exposed students of a range of job possibilities. AMES Youth teacher Kerry Moore said the students found the expo useful and enjoyable. “Because the job market is much broader in Australia than in developing countries, and most of our students haven’t had exposure through their personal networks, it is really valuable for them to go to job fairs and events like this,” Kerry said. “The students were able to observe and experience areas of employment which they might not have thought about or even been aware of. There was also a plentiful supply of written material for them to take away and people available to talk to or answer questions,” she said. The event was supported by the cities of Casey and Cardinia, Chisolm Institute, the ADF, Swinburne, the VACC, Federation University, Monash University and Skillinvest with more than 80 exhibits. Exhibitors included: Academy for Interactive Entertainment, Australian Catholic University, Box Hill Institute, Builders Academy Australia, Civil Contractors Federation, Flight Centre Travel Academy, Healthwise Fitness Academy, Master Builders Association, McDonald’s Registered Training, Organisation, Navitas, Racing Victoria Limited, RMIT University, Try Surveying, Victoria Police, Volunteer Abroad Adventure, William Angliss and YMCA. For more information on this story, contact Kerry Moore on: 8791 2401.